Intercultural insights from St. Norbert College undergraduates are benefiting communication students around the world. When studying abroad in Italy, there are a few gustatory must-dos. Like eating pasta and gelato. And sipping cappuccino at a local café. Hanna Klecka ’16 couldn’t wait to do all three when she landed in Florence in January 2015. But when she strolled over to Café Michelangelo for that cappuccino on her second day in town, she was shocked. And confused. Instead of a quiet, orderly queue streaming back from the counter, she was faced with a mass of humanity: everyone pushing, yelling and fighting to be the next one to score a cup of coffee from the barista. It was her first experience with culture shock. Or, more accurately, her first introduction to one of the common ways in which Italians communicate – a way that was very different from what she was used to in America. Ultimately, Klecka wrote, she learned to be a more persistent, aggressive café patron during her semester in Florence. And ultimately, the seventh edition of “Intercultural Communication” rolled off the presses containing not just Klecka’s story, but those of 22 other St. Norbert students. It’s not often that college students can contribute to their own learning experience, or that of their peers. But that’s exactly what’s been happening for years with Neuliep and his popular textbook, in use around the globe. 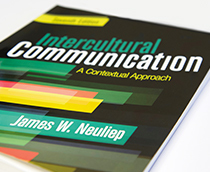 The book’s inaugural edition was printed in 2000, about a dozen years after Neuliep created a class called Intercultural Communication. He did so because then-president Tom Manion had charged the St. Norbert faculty with internationalizing its curriculum. There weren’t many textbooks on the topic when Neuliep’s new class debuted. The scholarly field of intercultural communication was founded in the 1950s, making it relatively young. So, in 2000, Neuliep wrote his own. The book became quite successful, and in 2012 Neuliep was working on a fifth edition (an impressive accomplishment, as the vast majority of textbooks never even reach a second. Part of the book’s new content? Student narratives about their experiences communicating abroad. Or, in the case of international students, reflections on their own cultural communication practices. Why student narratives? Neuliep often had students in class who had studied abroad, or were about to. International students were also attracted to his class. When the students shared their experiences with one another, it greatly enhanced his classroom teaching. He could do the same thing for his textbook readers by including some of his students’ intercultural experiences in the book. So Neuliep included the profiles in his book’s fifth edition, and also in the subsequent sixth edition and recently released seventh edition. An eighth edition with a January 2020 publication date is in the works. The bulk of the profiles are fresh in each new edition so, to date, several dozen SNC students have had their stories published. So far, no student has turned down a request to contribute to his book. Most are flattered and readily agree. Like Lindsey Novitzke ’11. Novitzke traveled to Africa with SNC’s Zambia Project, which helps provide education to kids who don’t have the opportunity to attend school. When she returned, she often discussed her experiences in the African nation with Neuliep, who was curious about Zambian communication practices. Novitzke explained touch was very important in the country, and Neuliep realized her experience would be perfect for the chapter in his book that discusses the role of touch in various cultures. 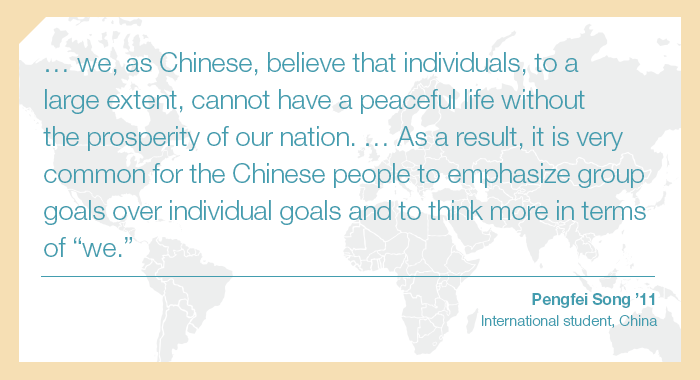 Many of the seventh-edition narratives came from St. Norbert’s international students, including those from China, Germany, the Faroe Islands and Saudi Arabia. Narratives were also penned by students who had studied abroad in places as varied as Ecuador, England, Japan and Spain. That geographic diversity, typical of all editions, impressed Joe Lancelle ’16, a communication and media studies major who used the sixth edition when he took Neuliep’s class. “When you go to a small school like St. Norbert, you don’t realize there are people here from all walks of life, and from different places all over the world,” he says. Lancelle’s narrative described both traditional culture shock – for example, dining in the home of a local, where cleanliness during food preparation didn’t appear to be a priority – as well as the angst of being in a foreign country and war zone, where he needed to be vigilant at all times. He also touched on “re-entry” shock, or the shock of experiencing your own culture once you’ve been away from it for an extended period. After the seventh edition came out with his tale inside, Lancelle was glad he opened up. “My family read it, and it was a pretty cool experience for them to see how I felt and the experiences I had, knowing it’s not something we talk about a lot. All three students say they didn’t fully grasp that they were contributing to an educational field while they were still studying it, something quite innovative. But as time passes, they realize what a special opportunity they had. And they definitely believe in the need for everyone today to know at least something about different cultures’ communication styles. Jim Neuliep (Communication & Media Studies) is the author of “Intercultural Communication: A Contextual Approach” (2017), published by Sage Publishing. Now in its seventh edition, the textbook is a leader in its field. An eighth edition with a January 2020 publication date is in the works. The book is used at Columbia, De Paul and Purdue universities, among many other institutions of higher education, and has been translated into numerous foreign languages. Since he joined the St. Norbert faculty in 1985, Jim Neuliep has published dozens of papers and seven books. He also created SNC’s Intercultural Communication class. The class was initially offered only to communication and media studies majors, but students petitioned the college to make the class part of its core curriculum – which it has been since the early 1990s. A Build Your Own Textbook initiative turned into a cause that aligns with student retention and success. Anna Czarnik-Neimeyer B.A. ’11, MTS ’17 shares more about the textbook philosophy of Robin DeRosa, keynote speaker at the 2017 T3 (Transformative Teaching & Technology) Conference at St. Norbert College.